Beautiful raw wool sheared from our healthy and happy sheep, ready for your knitting and crafting projects! At this time we have Romney wool available in a few different colour options. 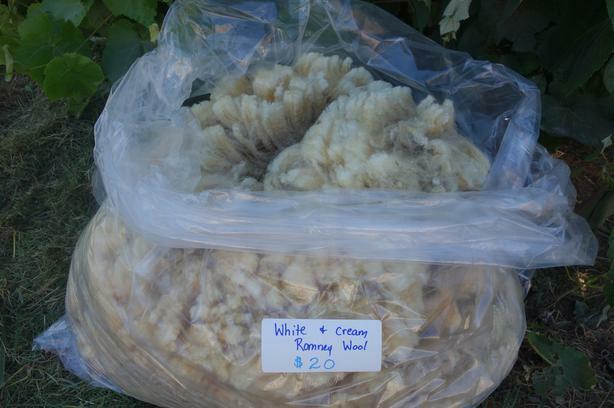 Romney wool has medium-length fibres with a high fibre diameter, which makes for strong wool. It's great for sweaters, coats and carpets, and is sought after due to its quality and versatility. Our fleeces are priced at $5 per pound. All have been skirted (roughly cleaned). All of our sheep are raised on pasture, organic hay, and some grain. No antibiotics or hormones.